Today in Things I Never Thought Were Actually Possible, Bandai Namco producer Katsuhiro Harada proposed to fans that maybe, just maybe, a Xenosaga HD Collection could happen. That'd mean a whole new generation of gamers could play through the Xenosaga trilogy, which was released for PS2 earlier this decade as a spiritual successor to the classic RPG Xenogears. 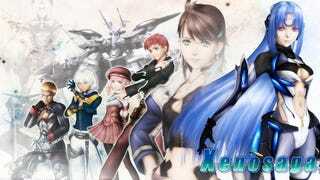 Though director Tetsuya Takahashi hoped to develop six Xenosaga games, financial realities forced him to stick to three, which saw mixed reviews when they were first released but have become cherished by a chunk of JRPG fans over time. Takahashi is off working on Xenoblade Chronicles X for Wii U, so don't count on his involvement, but Harada—who produces the Tekken games—seems to want an HD collection to happen. And all you have to do is tweet at him. I do understand that you all are desiring "Xenosaga HD collection". Also, I do appreciate all your passionate comments. I do understand your feeling to "tweet every day until the day Xenosaga HD collection comes real". However, what I need in order to achieve your dream, is not to have tweets from the "same person" sent to me every day. It has been a long time since Xenosaga has been released. It really brings back memories of those days they were developing the first Xenosaga staying up all night, when the TEKKEN Project was also staying up all night on the same floor at office. It was a very simple research at that time. Yet, research does cost money. And at that time, I was not able to seek business chance. In other words, I was not able to find the necessary market size that will pay for the development fee needed to create the HD remaster. Back then, the reactions on SNS and unique users were rather few in number. It may be that I didn't work hard enough. What I need, are the voices from many fans. This is a little different from having "messages sent every day from the same person". Although I do understand the deep love for the game, more than that, the cheers from as many "unique users" as possible is what is needed. Digging further, I will not be able to believe comments like "I'll buy 100 copies!". Most companies will not believe in it. It is not realistic for one person to tweet 100 times every day, or buy 100 copies alone. It's more realistic if you bring 10 fans to the game (not to mention, it wouldn't mean anything by having the same person suddenly creating alternate accounts. I will be able to tell those). What's important in these kinds of cases is the number of unique users. It means more to have 100 people mentioning they want the game one time, rather than having one person repeating it 100 times. A miracle would happen if several tens of thousands are gathered at the end. So go forth, RPG fans. Tweet at Harada in hopes of getting more JRPGs on new-gen consoles. Can't hurt, right?